Straughen family photo taken in the early 1930’s. Back row second and third are James Franklin Straughn and Prudence Fisher. 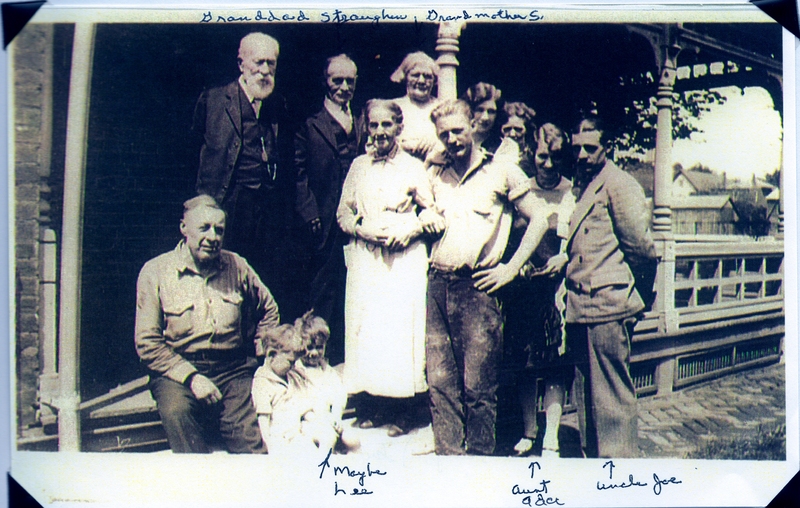 Front row on the right is Joseph Straughn and to his right is his wife Adeline Grunst. The other people are unidentified. My maternal grandfather’s name is William Straughen (pronounced “strawn”). This name has gone through spelling changes in almost every generation since it arrived on US soil in the mid/late 1700s. William preferred the ‘e’ at the end. His parents went by Straughn, however in the preceding 3 generations both spellings were common. I look comically at a FindaGrave cemetery where about 20 ancestors are buried, half using the ‘e’ and the other half omitting it. Parents, children and siblings choosing different spellings. It was long believed in my family that the name Straughn/Straughen was of German origin. My grandfather certainly believed that because during his youth in the 1930’s and 40’s he lived in a predominantly German area of New Jersey and learned German as a second language in school. It makes sense, German certainly seems like a language that would use a ‘gh’ that is pronounced like a ‘w’. For the purposes of this post, I will be using “Straughen” from here on out because it is the oldest, newest and slightly more commonly used among all the ancestors I’ve found than it’s sister spelling. Today when I was investigating the Straughen family line, I noticed that the first Straughen to cross the pond, John Straughen, was born in Scotland around 1750. Now this was surprising because it didn’t fit with the long-held idea that it was a German name. I didn’t want to jump to conclusions, because it is entirely possible that John’s family somehow ended up in Scotland at the time of his birth when they were not from there at all. I began investigating and I noticed several pieces of evidence that lead me to believe that Straughen is a firmly Scottish name, not German at all. For example, the large concentration of Straughens (etc.) in North Carolina, Virginia and Australia, all places heavily colonized by Scottish immigrants. So with all this information I am going to conclude that my mother’s side of the family has far less German blood than we suspected!